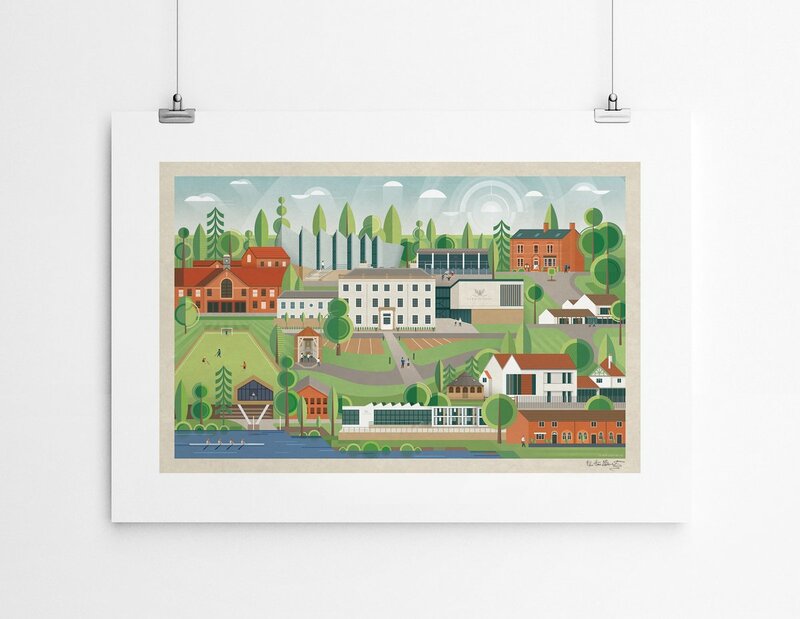 This artwork depicts the picturesque buildings and spaces of Yarm School, situated in the historic town of Yarm, North Yorkshire. 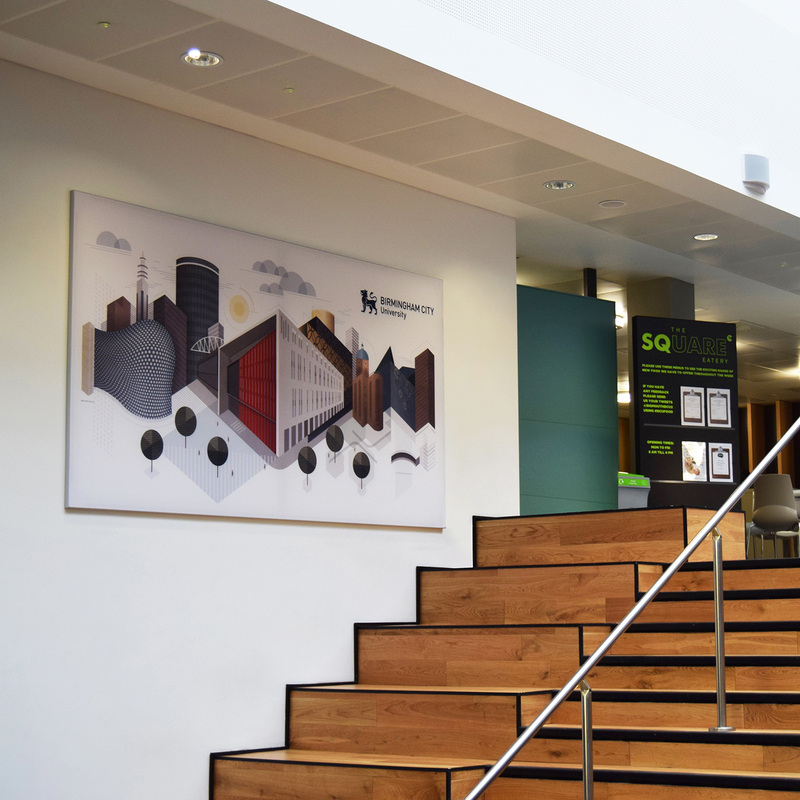 The artwork, commissioned to celebrate the school’s 40th year anniversary, was unveiled as a large print on acrylic, and is on display at the school for all to enjoy. 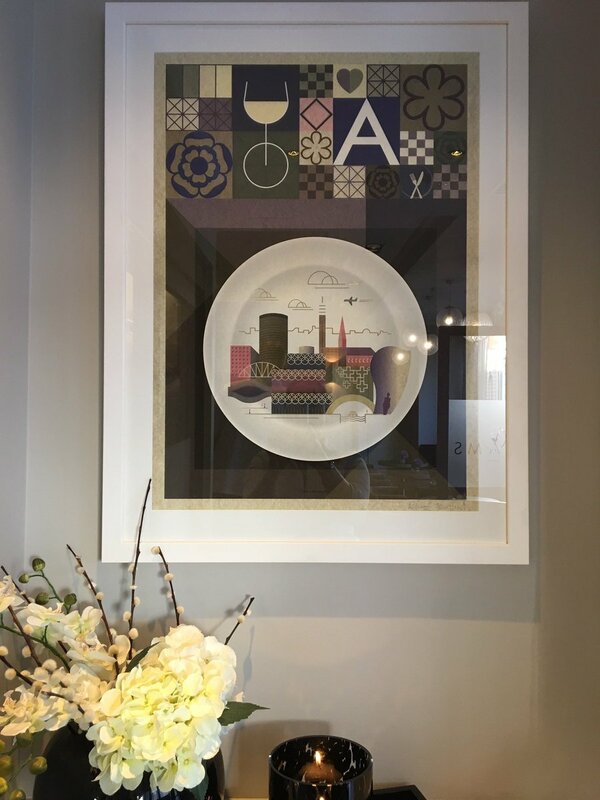 It’s now available as a beautiful gallery quality art print, printed onto lightly textured cotton rag paper using archival inks. 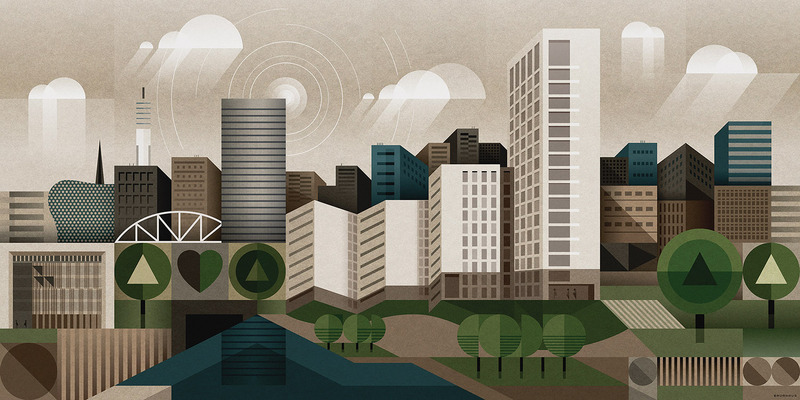 Elevate Property Group approached Brumhaus for a 15m long wall version of ‘This Green City’. Jim from Seven9Signs did a fantastic job replicating the artwork. 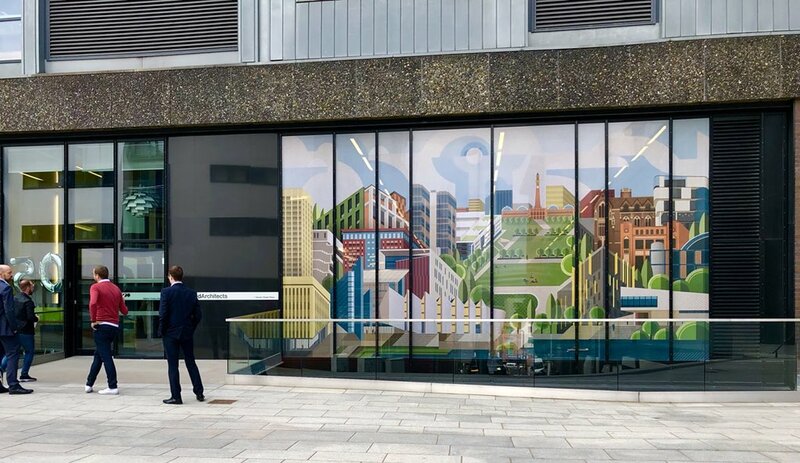 Visible from the street this painted mural showcases Birmingham’s skyline viewed from the south of the city. An 8m wide install on the premises of Associated Architects LLP on Severn Street, Birmingham. There were a number of key buildings to include in the composition, and with the added factor of the window mullions which divide up the glazing I had to come up with a practical and attractive initial sketch. Contravision vinyl was specified which allows plenty of daylight through the image into the office but appears solid from the outside. Associated Architects were very positive and the whole process went very well. I think I managed to do their fine architectural work justice and it was a pleasure working with them. 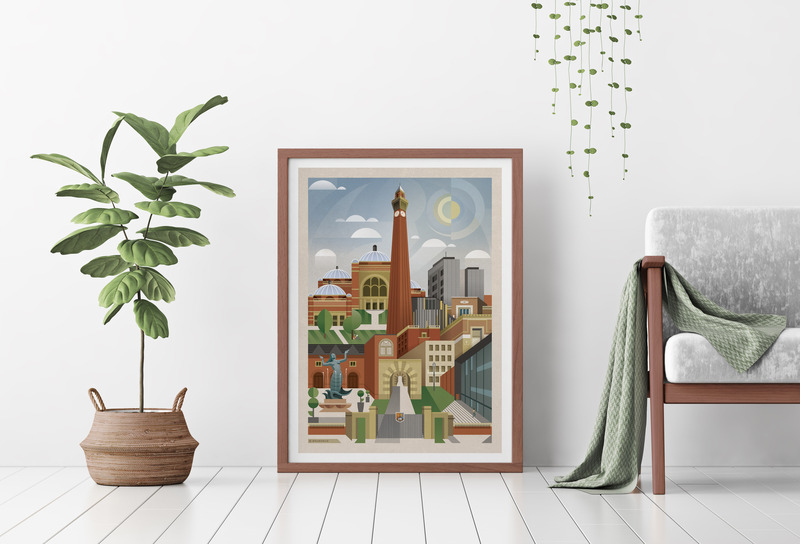 Commissioned for the University of Birmingham, this piece is now on wider release. So you can have your very own Old Joe in your home or office. From the red bricks of Aston Webb to the modern Library building, this artwork features much of the standout architecture around the campus. The perfect gift for graduates and proud Uni staff. 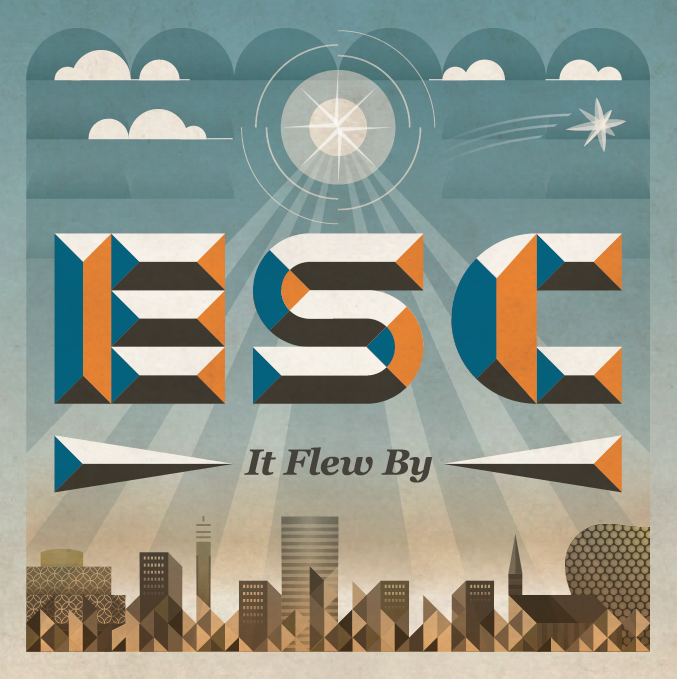 Provided artwork which was used on an album cover for Birmingham group Electric Swing Circus (ESC). 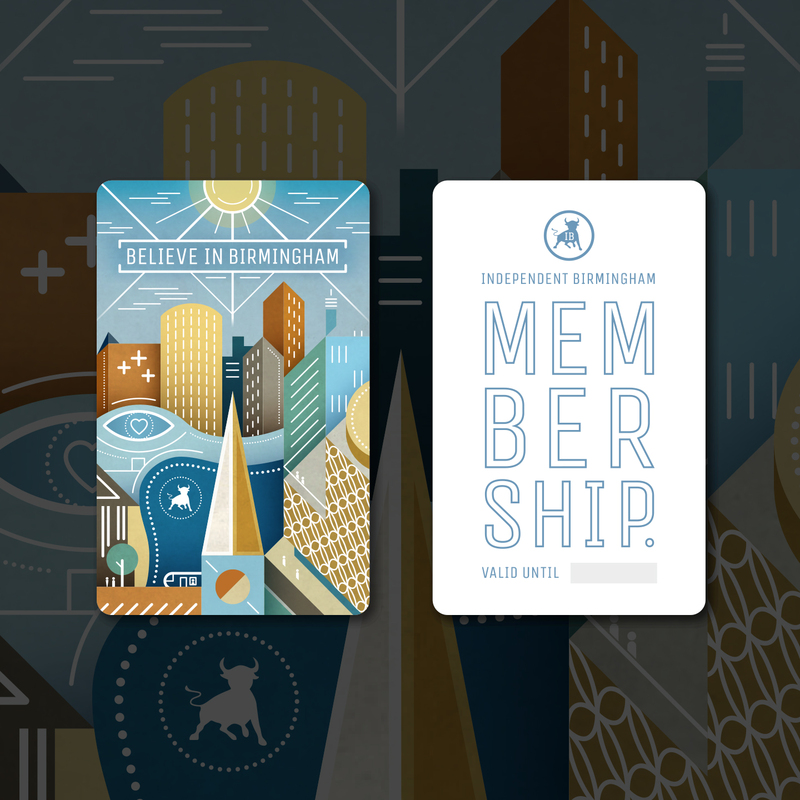 Brumhaus has designed the 2016 Independent Birmingham Membership Card. 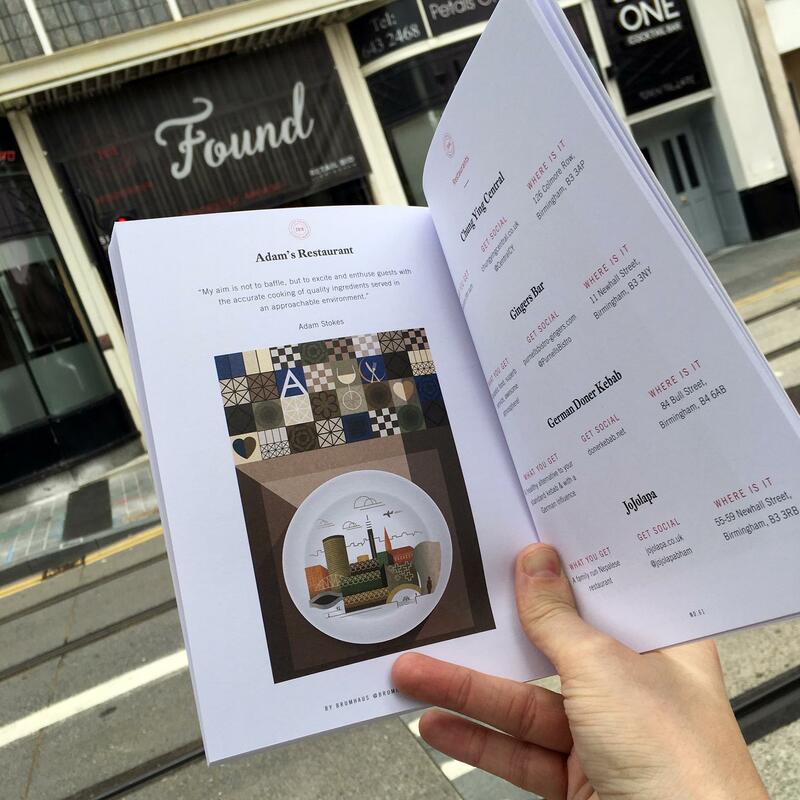 The card offers discounts and deals at over 80 of the very best independent cafes, bars, restaurants and shops in Birmingham. 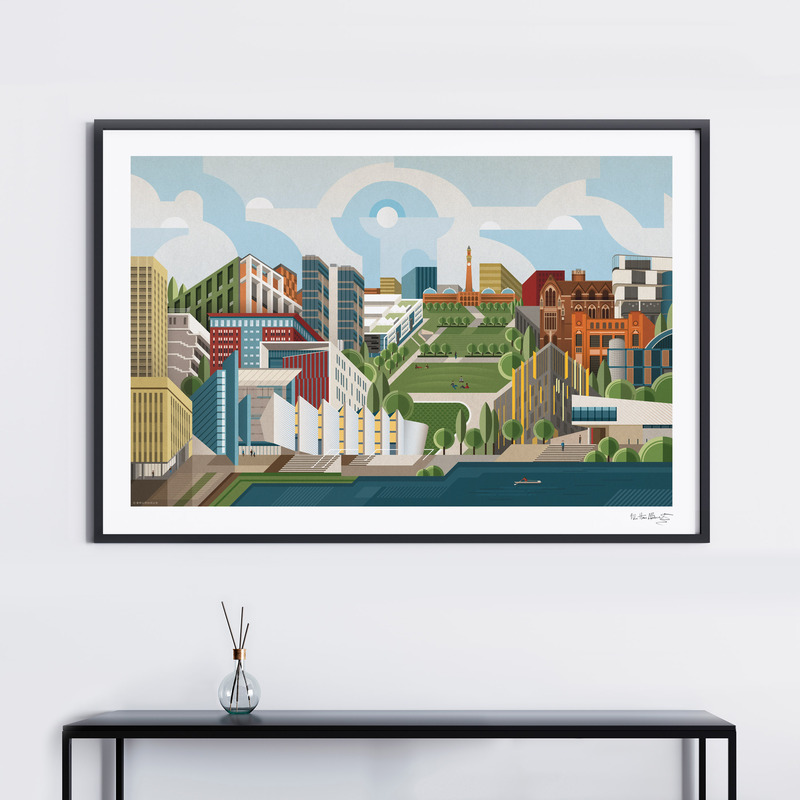 Artwork was produced as a large canvas print for the lobby of the Ashted Locks building. The piece was commissioned to be an interpretation of the building’s architecture whilst also including key landmark Birmingham buildings. Further to this the Alumno Developments logo was incorporated into the design. 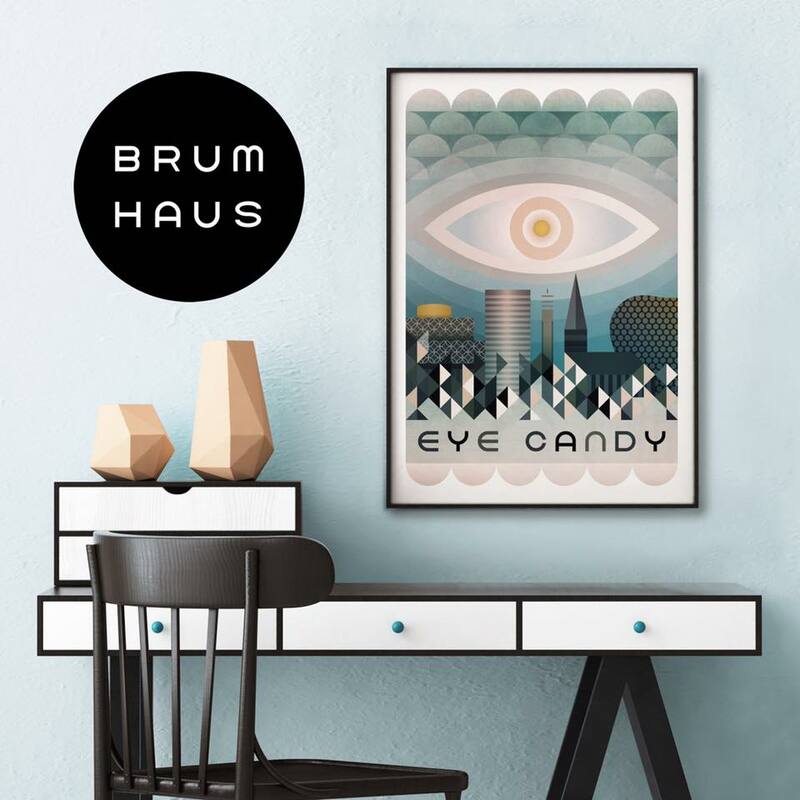 After the completion of the Curzon Building in Birmingham’s Eastside, Brumhaus was approached for a commissioned artwork. 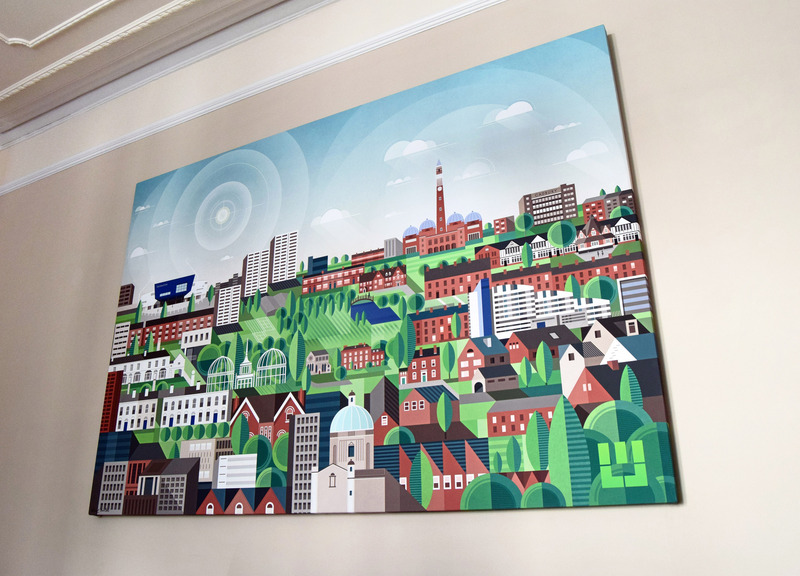 The brief for the artwork was to create a cityscape encompassing several of Brum’s feature buildings, with Curzon Building as the focal point. 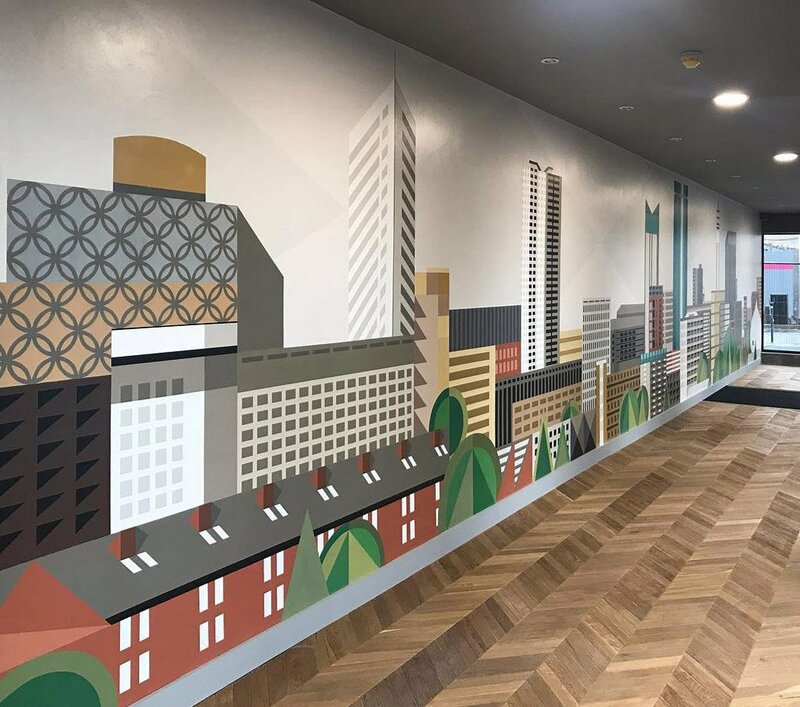 The completed piece was provided to BCU and was implemented on a large canvas print, size 3m x 1.5m, as well as framed art prints thoughout the building, and has been well received by staff and students.